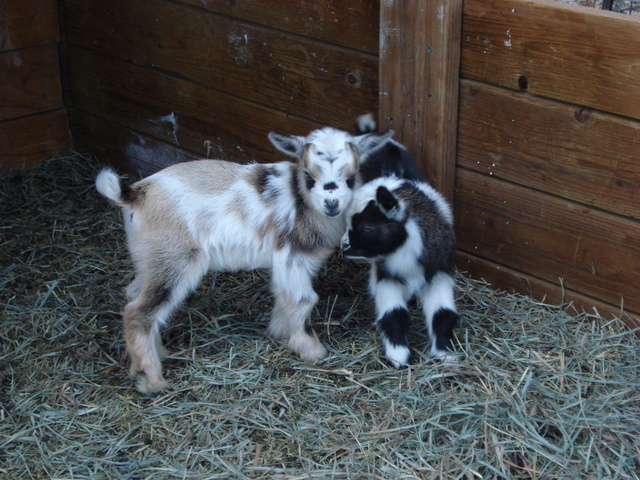 Nigerian Dwarfs are the smallest breed of dairy goats. They are economical, eating less than full sized dairy goats but producing up to 4 lbs (a gallon is 8 lbs) of milk a day during peak lactation. Their milk has a higher butterfat content than other dairy goats, resulting in a rich creamy, sweet tasting milk. Goat milk is usually tolerated by those who are lactose intolerant and who cannot drink cow’s milk. HEALTH TESTING: Quibeyn Farm maintains a closed herd. All goats entering from outside herds are quarantined and tested for CAE, CL, Johne’s Disease and Q-fever and the entire herd is re-tested every three years. New Mexico is considered a TB and Brucellosis free state so testing for these diseases has been discontinued as of 2017. As of June 12, 2017, all adult goats have tested negative for Caprine Arthritis Encephalitis (CAE), Caseous Lymphadenitis (CL), Johne’s Disease and Q-fever. MILK: Breeding with an emphasis on milk production and extended lactations, daily production records are maintained on all does in milk. On milk test in 2019. REGISTRATION: All Quibeyn Nigerian Dwarfs are either dual registered, or are registerable, with ADGA and AGS. SALES: Quibeyn Farm does not take reservations or deposits on planned breedings. All bucklings from first fresheners will be wethered and only exceptional bucklings from proven producers will be available as bucklings. Registration papers will be provided for all goats sold – it is the buyer’s responsibility to register/transfer the goat(s) into their names. All Sales are Final. Single goats will not be sold unless the purchaser has other goats. It is illegal to sell raw goat milk for human consumption in New Mexico without being licensed for raw milk sales. Therefore, Quibeyn Farm only offers milk for sale as pet food. For those who are interested in fresh, unpasteurized goat milk but who are not in a position to keep a goat, Quibeyn Farm offers goat shares for select does. Seven shares are available for each of these does. The owner of a share is entitled to receive the milk produced for that day. Quibeyn Farm will maintain the doe, including daily milking, feeding and other necessary animal husbandry, for a monthly boarding (agister) fee. Contact Quibeyn Farm at quibeynfarm @ gmx.com (remove spaces) for a copy of the sales and maintenance agreement.